GDPR marks a significant change in how businesses have to handle data when conducting business in the EU. But May 25th is just the beginning of the impact. The ongoing result of GDPR will show as business operations worldwide evolve to meet the requirements of additional compliance regulations that will inevitably come in other countries. The need to know what data you have so it can be appropriately protected is becoming more urgent. And as the GDPR deadline looms, most organizations are still not ready. 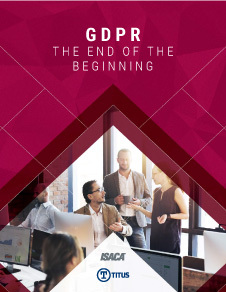 ISACA surveyed more than 6,000 of its members, business and technology professionals who provided their perspectives on their organization's GDPR readiness. This report details the insights from the research and confirms the need to focus on privacy and security by design on an ecosystem level to get ahead of the next policy measure that's bound to come.